A smaller show of prime cattle was forward, although a great show of bullocks resulting in a great trade topping at 261.5p for a fantastic Limousin bullocks shown by J.C. & D. Nicholson & Son, The Gill, Messrs Nicholsons run of cattle averaged 255p. A poorer show of heifers on offer continued to sell at recent rates and peaked at 253.5p from Messrs Retson, Gardrum. Limousin 261.5p, 259.5p The Gill, 257.5p Dashwellgreen, 257.5p, 256.5p The Lake, 253.5p Dashwellgreen, 251.5p The Lake, 250.5p Fenton Farm, 249.5p, 246.5p Dashwellgreen, 244.5p The Gill, 241.5p Houghton House, 239.5p Houghton House. British Blue 246.5p Dashwellgreen, 235.5p Houghton House. British Blue 253.5p, 242.5p Gardrum. 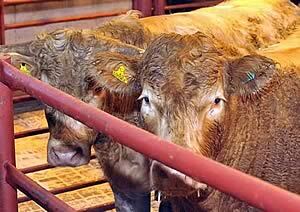 Limousin 246.5p Hallburn, 243.5p, 234.5p Hallburn, 225.5p (x2) Sceughdyke, 222.5p Becton Hall. Limousin £1,854 The Lake, £1,738, £1,725, £1,711 The Gill, £1,710 The Lake, £1,673 Dashwellgreen, £1,667 The Lake, £1,640 Houghton House, £1,569 Houghton House, £1,552, 31,546, £1,521, £1,448 Dashwellgreen, £1,440 Fenton Farm. British Blue £1,695 Houghton House, £1,602 Dashwellgreen. Limousin £1,318 Hallburn, £1,290 Becton Hall, £1,262 (x2) Sceughdyke, £1,217, £1,125 Hallburn, £1,234, £1,201 Sceughdyke. Charolais £1,273, £1,211, £1,206 Sceughdyke. British Blue £1,444, £1,406 Gardrum, £1,340 Becton Hall. Black & White 193.5p Whins, 173.5p Nirvana. Black & White £1,344 Whins, £876 Nirvana. A small offering OTM cows continued to sell well with more required to satisfy demand. Top price of 215p for Limousin from T. Armstrong & Sons, Sceughdyke. Limousin 215p Sceughdyke, 149p Ryehills, 137p Harehill. Black & White 146p Becton Hall, 103p Low Moat. Limousin £1,397 Sceughdyke, £946 Ryehills, £945 Harehill. Black & White £1,073 Becton Hall. An excellent show of 3,251 prime lambs was forward to a busy ring of buyers with new customers operating. A quality show of lambs were forward and met a flying trade with one of the best averages of the week. Lightweight lambs continue to sell in excess of £70 and are probably best cashed whilst fleshed. The overall average of 233.6p per kilo was above vendors expectations. The demand for best export lambs was as good as seen for many weeks regularly selling between 240p and 270p and remain short of buyers requirements. Top price of 271p per kilo for Texels from J. Marshall, Hermitage with a top per head of £112.50 for Charollais from W.L. Musgrave & Son, Cardew Hall. Charollais £112.50 Cardew Hall, £109.50 Kimmeter Green, £107.80 Cardew Hall, £102.80 Brisco Meadows. Texel £109.50 Kimmeter Green and Cardew Hall, £108.80 Miller Hill and Culquhasen, £107.80 Corriefield. Suffolk £106.50 Culquhasen, £105.80 Barnglies, £104.80 High Wreay, £103.80 Barnglies. Greyface £103.80 Sceughdyke, £83.80 Stanger Hill, £79.80 Gillesbie. Texel 271p Hermitage, 265p North Greenhill, 264.3p Mossband, 262p Cubby Hill and Corriefield, 260p Allanshaws, 259p Miller Hill. Charollais 256p Beckhall, 249p Wyseby Hill Cottage, 246p Cardew Hall, 242p Harelawhill, 239p Porterstown. Suffolk 253p Barnglies, 250p Cottage, 247p Bleatarn, 246p Shankfieldhead, 245p Scalehill and Whins. Greyface 233p Stanger Hill, 231.6p Golden Lane, 231p Sceughdyke, 225p Golden Lane. Dorset 228p Cowcorse, 224p Old Rectory. Cheviot Mule 224p Allanshaws, 214p Sundhope. The 1,328 light weight lambs sold to a top of £91.80 for Texels from Cubby Hill, £83.80 High Acres; Suffolk £85.80 Scalehill, £78.80 Hall Farm; Charollais £78.80 Hallburn, £75.80 Scalehill; Cheviot Mule £74.80 Sundhope; Dorset £73.80 Old Rectory; Greyface £71.80 Golden Lane; Jacob £70 Kimmeter Green; Beltex £62 Cowcore; Blackface £61.80 Golden Lane. Also marketed during the week on a weigh and pay basis were 240 lightweight lambs between 26 and 36 kilos, which are now sought after weekly. A smaller show of 745 prime hoggs were forward on the second week of July and the sale average was an impressive 167.1p per kilo, 9p up on the week. Demand for hoggs is likely to continue, as long as they are carrying flesh. 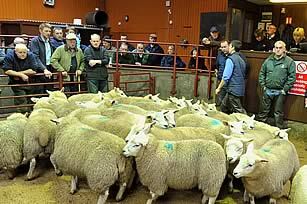 The sale was topped at £96.50 per head for Texels from Haithwaite and to 207p per kilo for Blackface from Meggethead. Texel £96.50 Haithwaite, £84.50 Marygate, £82.50 Roses Bowers. Charollais £88.50, £84.50, £80.50 Golden Lane. Greyface £84.50 The Haining House, £75.50 Thorns, £70.50 Haithwaite. Blackface £82.50 Pirntaton, £80.50 Winterhopeburn and Pirntaton, £78.50 Meggethead. Romney Marsh £78.50, £75.50 Holme Farm. Suffolk £76.50 Lyneholm, £73.50 Thorns, £72.50 Haithwaite. Blackface 207p Meggethead, 201p, 196p Cramalt. Texel 201p Norfels, 190.3p Haithwaite, 190p Cowcorse. Suffolk 195p Cottage, 188p Thorns, 187p Lyneholm. Greyface 189p Thorns, 176p, 167p Marygate. Another large show of 4,047 cast ewes and rams were forward to the usual ring of buyers with trade for all classes sharper on the week. Small ewes and rams of all classes continue to be short of buyers requirements. Heavy ewes to £126.50 for Texels from Townfoot, £122.50 Riverside, £119.50 Wick; Charollais £124.50 Styhill and Riverside, £110.50 Styhill, £104.50 Wood Vale; Suffolk £100.50 Skelfhill, £98.50 Pirntaton, £97.50 Allanshaws; North Country Cheviot £94.50, £89.50 Allanshaws, £88.50 Woodville; Cheviot Mule £92.50, £84.50 Muircleugh, £84.50 Mossburnford, £72.50 Styhill; Zwartbles £86.50 Muircleugh; Leicester £84.50 Stotsfold, £82.50 Styhill, £79.50 Riverside; Greyface £74.50 Wilseydown, £73.50 Nirvana, Unthank and Wick, £72.50 Trecorner; Oxford £68.50 Guards; Dorset £68.50 Moonspark, £67.50 Roseland, £66.50 Cross House; Romney Marsh £67.50 Holme Farm. Hill ewes to £75.50 for Lleyns from Peacock House, £74.50 Styhill, £72.50 Peacock House; Blackface £69.50 Chaplehope, £65.50 Thorns, £62.50 Marygate; Hill Cheviot £66.50 Skelfhill, £62.50 Cowburn, £60.50 Cottage; Jacob £55.50 Golden Lane, £49.50 Cardewlees; Swaledale £54.50 Nettling Flatt, £45.50 Stonehall, £42.50 Cottage; Herdwick £44.50 Cardewlees, £34.50 Tarnside House. Rams to £170.50 for Suffolks from Pirntaton, £140.50 Styhill, £114.50 Francis; Texel £158.50 Wick, £126.50 Pirntaton, £120.50 Allanshaws; Charollais £138.50 Thorns, £92.50 Ballygawley; North Country Cheviot £108.50 Haithwaite, £84.50 Allanshaws; Leicester £102.50 Jonesboro; Beltex £98.50 Haithwaite; Lleyn £90.50 Haithwaite; Blackface £86.50 Meggethead, £84.50 Pirntaton, £76.50 Albierigg; Swaledale £66.50 Fordlands.